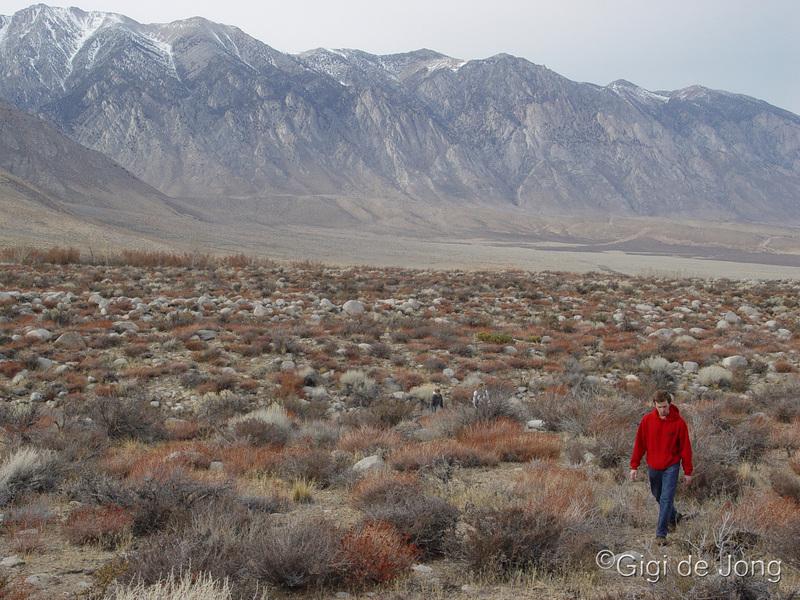 A springtime hike in the Owens Valley is pure joy. Daytime temperatures are pleasantly warm and the hours of daylight increase with each day. The trees and bushes are blossoming and wildflowers can be seen in the fields and alongside streams. There is a sense of rejuvenation and the breeze carries the sweet perfume of life in renewal. The snow covered peaks of the Sierra Nevada and the White Mountains provide a majestic backdrop and the allure of a mountain hike is strong. It’s still winter at the higher elevations where the snow is deep and the air is chilly. 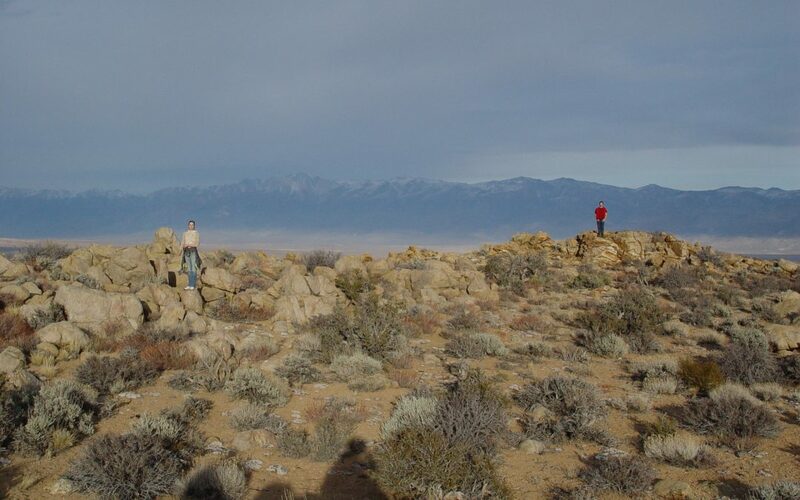 So for those who want to begin the hiking season early, but without snowshoes, crampons and avalanche beacons – the Owens Valley and surrounding foothills is the place to be. Whether you want a quiet walk with a loved one or an energetic hike and a new adventure you’ll find the perfect time and place here. There are numerous footpaths and trails that parallel the many canals in and around Bishop and there are roads and tracks that run alongside the many miles of the sinuous Owens River. All of these offer the opportunity for either a short stroll or a long interesting hike. A walk along the shores of Pleasant Valley reservoir is easy and quiet. The road is closed to vehicle traffic and it’s a great place for an early morning or late afternoon stroll. Birdlife is abundant and the fishing is fantastic. The canals around the outskirts of town are a great place to let kids and dogs romp and dip in the cooling water. The recently restored Buckley ponds have access for the physically disabled to be at the waters edge to fish or just enjoy the view. Between the Pleasant Valley dam and Tinemaha reservoir the Owens River twists and turns for 40 miles. The tracks and trails undulate alongside the river over grassy banks, between tall reeds and over sand dunes. The fauna and flora along this life-giving river is plentiful. I’ve counted a large number of bird species on any given day out here and been fortunate to see beaver and bobcat. Hiking alongside the waterways of the valley floor provides little elevation change, but it has an almost limitless number of miles of diverse open terrain and solitude. It can be as adventurous and energetic as you make it. 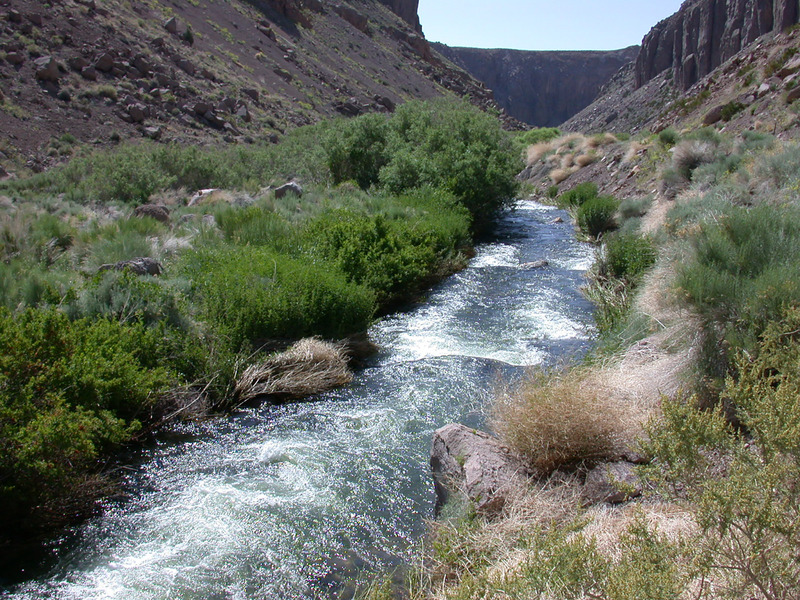 Hike the Owens River Gorge in spring. When the snow is still deep and the temperatures still low at higher elevations, the Owens River Gorge offers warmth, protection and a very different view of the Eastern Sierra. The river runs clear and deep and the gorge is a magnificent riparian habitat with an increasing biodiversity following rewatering and ongoing restoration by the Los Angeles Department of Water & Power (LADWP). Bird species are flourishing and a native fish, the Owens Tui Chub, once threatened and endangered, is now protected in this predator-free habitat. From Bishop drive north for about 12.5 miles along Highway 395 to the Gorge Rd intersection (at the bottom of the Sherwin Grade) and turn right onto Gorge Rd. Head east for .7 miles then turn left at the T-junction. Follow Gorge Rd up the grade for 3.3 miles, turn right and park in the clearing to the right of the road. A chained gate restricts vehicle access and this is where the hike begins. It’s an out and back (or down and up) for as far as you wish to hike. The first 1.25 miles is paved to the LADWP power plant and just beyond that the track becomes dirt. Further upstream you’ll come across the skeletal ruins of a now derelict power plant and on either side of the river you’re likely to see climbers testing their skills on these vertical walls. Continue further and the track becomes a trail and scrambling and clambering become the order of the day. Take a picnic and find a cool, sheltered spot to sit quietly and listen to the tumbling call of the canyon wren. Return to your vehicle the way you came. You can’t get lost the canyon walls will guide you. 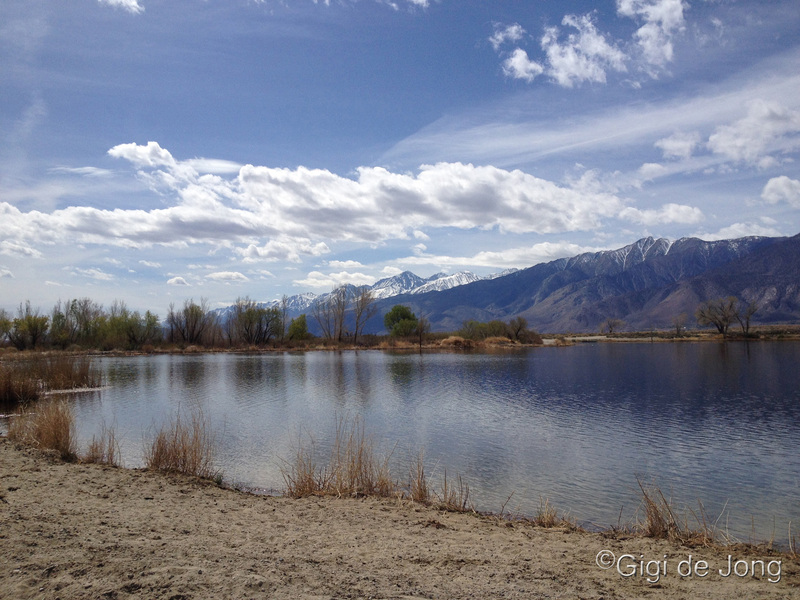 Spring in Bishop! The air is warm and the sun is bright and hiking out across the sagebrush and up onto the rocky outcrops of the Tungsten Hills is especially lovely at this time of year. With easy access from the Horton Creek campground (closed for camping during winter) you can park your car here and take a short walk or long hike up and around this fascinating geological feature. The hills are named for the tungsten that was mined here until the late 1940s and are composed primarily of granite and quartz diorite. It’s a favorite place for rock hounding and crystals of red garnet can still be found here. Springtime brings the birdsong as large populations of breeding songbirds nest along the willow-lined streams that meander among the hills. It also brings the desert peach into bloom with its pink blossoms and jasmine-like scent giving soft color and sweet fragrance to this arid landscape. The bitterbrush presents its yellow color and spicy perfume in late spring and you’re very likely to see mule deer, often in large herds, which have wintered in the foothills to feed on the tender shoots of the bitterbrush and sagebrush. You’ll probably see jackrabbits, ravens, red tailed hawks and, if you’re lucky, a chukkar. Towards dusk you may hear or see coyote as they begin their crepuscular activity of looking for a meal. Know too that there are mountain lion in these hills. Sightings of these big cats, which biologists call Puma concolor – literally ‘cat of one color’, are rare and no attack has ever been recorded in the region. Whether you have an hour or a whole day to explore this region it’s well worth the time. The views are breathtaking with vistas in every direction from the numerous peaks. Survey markers can be found on many of the peaks and only two, the Tungsten Point and the unnamed Tungsten Hills highpoint, have summit registers. So if you’re a peak bagger, you should definitely add these to your list. Remember to dress in layers. Bring the kids, the dogs, your friends, lots of water and perhaps even a picnic. Definitely bring your camera. For more detailed information on these wonderful hiking areas and specific trails and destinations visit the Bishop Chamber of Commerce and Visitors Center. Located at 690 N. Main Street in Bishop the friendly, knowledgeable staff can supply maps and answer all your questions. You can also click here to see our Hiking Page. Call (760) 873-8405 or request one of our great travel brochures here.